Founded in 1972, the Chelmsford Community Band is a nonprofit, volunteer band comprised of over 50 woodwind, brass, and percussion instrumentalists from all walks of life, including professional musicians, educators, engineers, and small business owners. Members come from not just the Chelmsford, Massachusetts area, but from around Massachusetts, New Hampshire, and Connecticut, rehearsing Tuesdays from September through June at the Chelmsford Center for the Arts. The band provides its members with the opportunity to share their passion for music with the community through a variety of concerts throughout the year. Our concerts range from formal performances to outdoor concerts and allow us to bring a variety of music to our audiences including traditional marches, contemporary pieces, show tunes, and holiday music. Our free summer performances in the Chelmsford Common are a fun way to expose the whole family to live music. 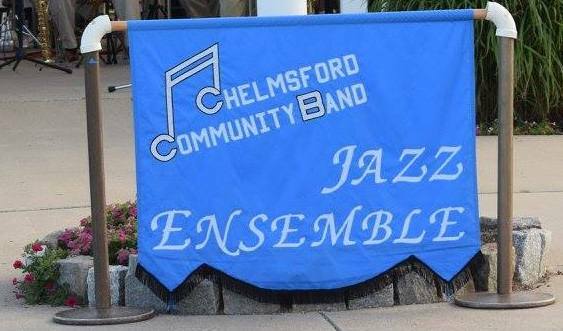 The Chelmsford Community Jazz Band was formed in 1998 to give concert band members with a love for playing big band music an outlet for that passion. The CCJB gave its first performance at the CCB’s annual pops concert on April 25, 1998. Since then, the ensemble has performed several times a year — at the annual winter concert, the pops concert and the summer concerts on the common. The ensemble’s wide repertoire consists of big band standards and popular selections from noted jazz artists that appeal to audiences of all ages. The band’s sound matured steadily under the expert direction of Tony DiBartolomeo, who was director of the concert band from 1991 to 2001, and director of the jazz ensemble from its inception until the end of 2002. In March 2003, Paul Combs became the jazz ensemble’s director. A performer and teacher for over 35 years, Paul has his own nine-piece ensemble, The Pocket Big Band, which performs all over New England. Paul was with the jazz ensemble until September 2015, when his professional life took him away to San Francisco. We would all like to thank Paul for his years at the helm! In September 2015, the jazz ensemble took a new turn with the introduction of our new jazz ensemble director, Arthur Bakopolus to the bandleader’s podium. Art brings a fresh new attitude to the jazz ensemble, and we welcome his genuine perspective.